Welcome to the 73rd edition of Follow Friday 40 and Over!! 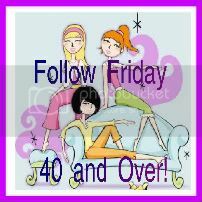 I am so excited that Follow Friday 40 and Over is back! Looking forward to seeing everyone!! Have a great weekend Java! Thanks so much, Ms. Java for letting me join in!!! HOPE you have a wonderful weekend! Not as happy as I am! So glad to have you back! Have a great Weekend!!! thanks for hosting Java!! Wheeee!!!! Another week of hopping. Thanks Java! Hello everyone! I hope you can stop by my blog and say hello. Have a great weekend and thank you Java! Hi All! I'm a "longtime listener, first time caller" LOL! Hope to check out a whole bunch of new blogs!